Q: What is Cerebral Amyloid Angiopathy (CAA)? A: CAA is defined by a type of protein deposit in the wall of blood vessels in the brain. CAA is actually a common process in aging and usually harmless. In some people with severe CAA, however, the protein deposits cause the blood vessel walls to crack, in which case blood can leak out and damage the brain. The damage from this process is called a bleeding (or hemorrhagic) stroke. The figure displayed to the right shows a microscopic view of a section of a brain with CAA. The round structures are blood vessels cut in cross section. 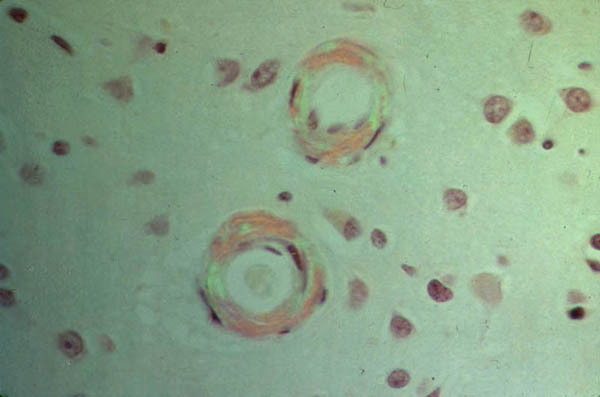 The walls of the vessels contain amyloid, which stains pink with greenish streaks when illuminated by the technique used in this figure. The protein deposits in CAA are made of a material called amyloid that is very similar to deposits found in the brain in Alzheimer's disease (AD). Despite this close relationship and an increased tendency for the two diseases to occur together, most patients with AD do not have CAA, and most with CAA do not have AD.